Last weekend's junket to Central Oregon wasn't strictly a beer trip, but it nonetheless provided me with an opportunity to check up on a few places. Boneyard Beer was the first place I went and you've already read that post, right? Of course. There's more. When I heard there was a brewpub opening in Sunriver, it struck me as a no-brainer. In all the years we've been going down there for winter sports and occasional summer fun, there was never a go-to place for good beer in the Village. A local brewpub would change that. 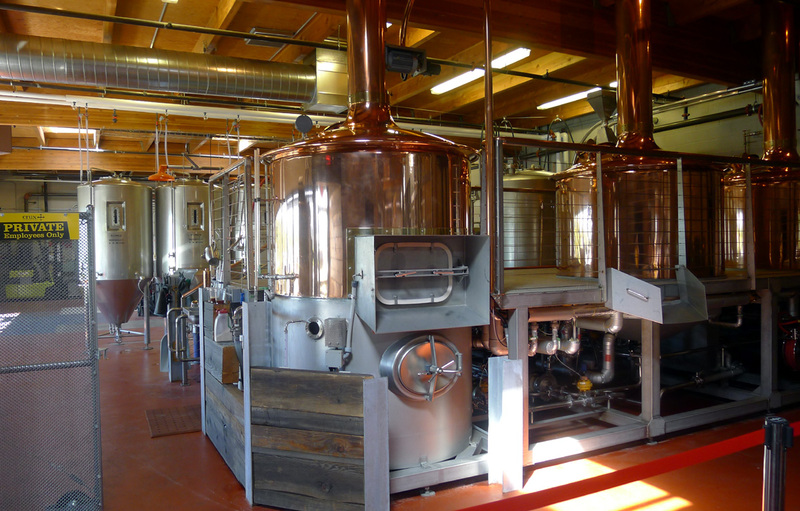 It turns out plans for Sunriver Brewing have been in the works for a couple of years. 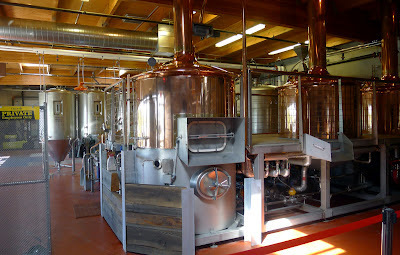 However, the owners revealed almost nothing (earlier story) about brewing capacity, brewers, beer styles, etc. As I like to say, there are reasons for everything and the reasons for stealth in this case become fairly apparent with a visit. First, let me just say this is an attractive space...high ceilings, very open, nice bar, comfortable seating inside and out. It's in a great location, right behind the almost always buzzing grocery store. The space is not gigantic, but will certainly suffice in all but the busiest times. What you need to know is there is NO brewery here. There are two fermenters occupying an area of the pub and looking quite ornamental. I don't know if this is where they intend to eventually install a brewery. If it is, the brewery will be very small, indeed. It seems to me they would be well-advised to forget about on-site brewing and use the space they have for seating. Outside seating will be implausible for much of the year. Our very cordial server told me the house beers are being produced in Redmond at the moment. It's a straight-forward list: IPA, Pale Ale, Amber Ale, Stout. They were out of the pale. The others were decent, if not memorable beers. They will surely build the list out as time goes by. There was a nice selection of guest beers, including Hop Venom. That list will almost certainly rotate. You can view the menu and pricing on the Sunriver Brewing website. Like most brewpubs, this place will appeal to adults and families. It's unlikely to be much of a young adult drinking hangout. Whether they ever make beer here is immaterial. 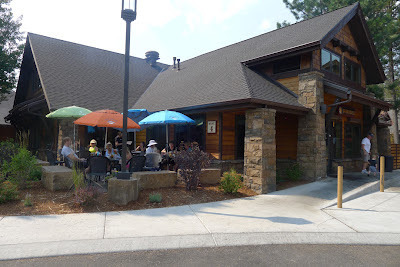 This is a nice addition to the options in Sunriver, which haven't been great over the years. I have to admit the Little Woody Barrel-Aged Beer and Whiskey Festival was not on my radar screen as the Sunriver trip unfolded. But I immediately planned to drop in when I realized it was happening and the times were convenient. This was apparently the second rendition of this festival, focused mainly on barrel-aged beers...of which I am a fan. I didn't bother with the whiskey...I'm sure it was fine stuff, just not my bag. 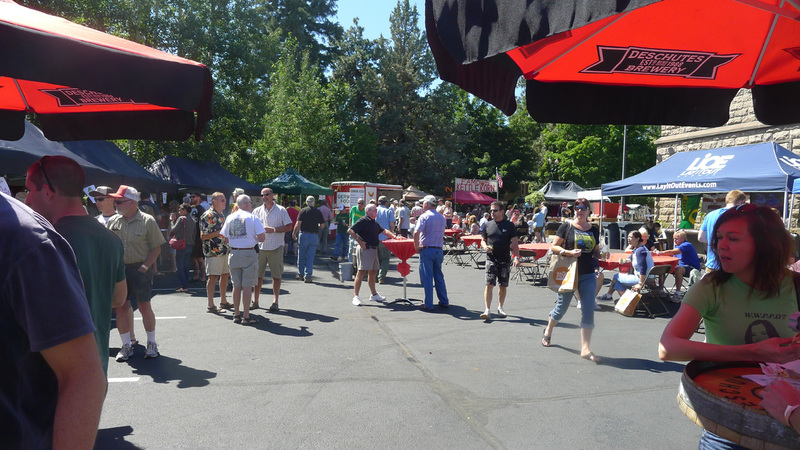 The festival was held primarily in the parking lot next to the Deschutes Historical Society building. The Society received a portion of the proceeds from event organizers, which is terrific. 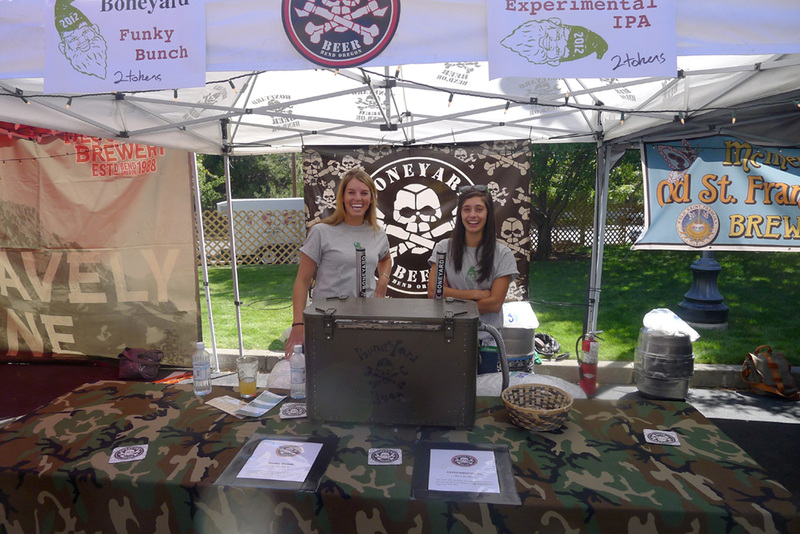 Beyond the beer and whiskey, there was live music, food vendors and promotional booths. There was even a sports area where college football was showing on a fairly large TV. Beer people think of everything! There were apparently 14 breweries here, including Oakshire, Deschutes, Ninkasi, Boneyard, Block 15, Three Creeks, Bend Brewing and others. Most featured two beers. I was surprised to find that every beer required 2-4 tasting tokens. Given the rarity of the beers, I guess it made sense. However, some of these beers were not a great value at 3 or 4 tokens for a four ounce taste. Sorry. Block 15 (Corvallis) brought a fantastic Framboise. It was light, crisp and slightly sour. This is a beer you could drink a lot of on a warm summer day. 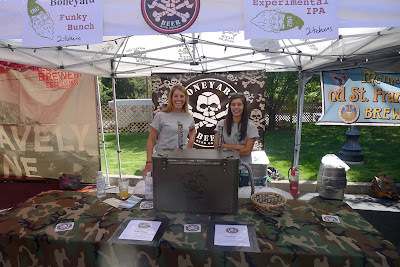 Boneyard's Experimental IPA, aged in bourbon barrels for 11 months, was interesting. I was surprised to find it had a touch of sour. Hop aroma and flavor were in the background. I suspect people either loved or hated this beer. Deschutes Plum Line Sour, infected with Brettanomyces and Lambicus and aged in oak casks, was brilliant...light and prefect for a warm day. Three Creeks brought a tweaked version of its popular Hoodoo Voodoo IPA...called Deja Voodoo. Aged in Pinot Noir barrels for nine months, this beer combined strong oak notes with subtle fruit character. Lost in there somewhere was the hoppy aroma and flavor of standard Hoodoo Voodoo. Not bad, though. Sometimes it's quite fun to see how the other half lives. This is the first festival I've been to outside Portland...where you could not possibly hold such an event in such a small space. The execution here was mostly pretty good. Check it out next year if you can. The Crux was definitely not on my planned itinerary, but Saturday's trip to Little Woody opened up an opportunity to see other sights. At the festival, I ran into Ezra Johnson (The New School blog). He had come over on the Brewvana bus from Portland and wanted to visit CFP. I tagged along because I had transportation. 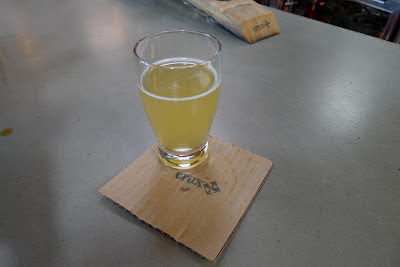 If you want to know more about the roots of the Crux Fermentation project, I recommend you take a look at Ezra's post here or Jeff Alworth's post here. Briefly, this place is the brainchild Paul Evers, Dave Wilson and former Deschutes brewmaster, Larry Sidor. It's apparent that a rather large investment went into getting this place opened. It's gorgeous and amazing at the same time. Each of the beers we tasted was nicely executed. 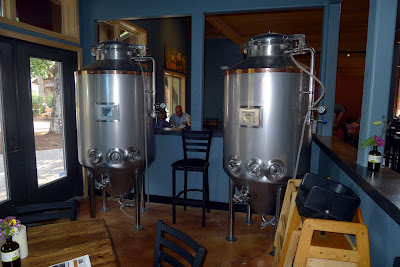 There are clearly a lot of creative juices flowing here and this place will evidently evolve into a much larger brewing operation down the road. If you're headed to the Bend area, plan on visiting the CFP. Be advised this place is not exactly on the well-beaten path. It's located in an industrial area south of downtown and not the easiest place to find without a map or phone GPS. Coming soon...Eastern Washington road trip and report!